9 Reasons why Cabarete is the ultimate water sport destination in Central America / Caribbean. There are so many places in the world where you can lie on a sun-soaked beach and do absolutely nothing (if that’s your thing), but where do you go if you want an action-packed, adult sports holiday with a variety of different watersports or land-based sports to choose from, or if you are looking for an adult surf camp? Cabarete, on the North coast of the Dominican Republic, is your answer: Easy to get to (with direct flights from Europe and North America) and a quick transfer from Puerto Plata (POP) international airport, Cabarete has a huge variety of sporty activities on offer, both water-based and land-based. WHY CABARETE FOR AN ACTIVE ACTION PACKED VACATION? It’s safe in the Dominican Republic: Friendly and welcoming locals will offer you their hearts for visiting their beautiful island. Tourist Police are on hand in all popular areas to help keep you safe. So much to do: Unlike Costa Rica where getting around involves some lengthy journeys, Cabarete is reached after a quick journey from North America so the same day as you leave home, you’ll be on beautiful beaches for a great surf vacation. Cabarete itself offers so much to do, all within a very small area; you won’t waste whole days travelling around to see and experience some really diverse scenery. Surfing beaches, kitesurfing, windsurfing, canyoning, horse riding, history, culture and so much more, are all within a few miles of each other. Great Nightlife: Once the beachside dining is over, tables and chairs are put away and Cabarete beach becomes the ultimate party venue. You can dance beneath the palm trees with your bare feet in the sand. 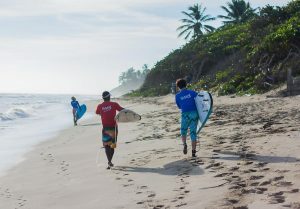 Taking part in the party is not mandatory of course; with a short walk, you can make your way back to a surf camp like Swell for a more peaceful end to the day. Culture; The Dominican Republic is one of the islands discovered by Christopher Columbus in the late 1400’s. Close to Cabarete is the historic town of Puerto Plata, with its ancient fort dating from 1564 and built by King Felipe II of Spain. The town has many old and restored timber buildings, reminiscent of those you might see in old Havana, for example. Music: To the Dominican people, music is not just a hobby, it’s a way of life. There are so many music festivals throughout the year that there will normally be something going on during your visit. Cabarete hosts part of the Dominican Republic Jazz Festival (opens a new window) each November (in 2018, it’s November 3rd and 4th). Merengue, Bachata, Salves and Palo are all traditional Dominican music genres, but you’ll also hear Reggaeton, Jazz, Rock and Hip Hop. Dancing is as popular as the music danced to and there are many places in Cabarete where you can take dance lessons from the most natural movers on the planet. Beautiful Beaches: Light sandy beaches and turquoise water abound. You can set off to find your own deserted cove between Cabarete bay and Encuentro, or stick to one of the more expansive sandy bays. Visit places like Playa Grande for the day for a fish BBQ on the beach. Cabarete has the most ideal and consistent beginner surf conditions anywhere in the world. 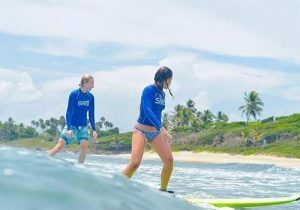 With warm water year round and ideal wave conditions for getting your first rides on a surfboard, Swell surf camp in the centre of Cabarete is one of the best adult surf camps in the world for beginner surfers. You should give yourself a week at a surf camp like Swell Cabarete Surf Retreat to be able to master your pop up and to start to turn the surfboard to ride along the wave. Completely mastering the art of surfing takes a good deal longer, but an award-winning adult surf camp like Swell will give you the very best start and certainly get you hooked on the incredible feeling of surfing a wave, regardless of your age! Along with great surf conditions for beginners, Cabarete also enjoys near-perfect kite-boarding conditions. The wind picks up in the afternoon generally and is side-on, which is one of the reasons why learning to kite in Cabarete is such a good idea (side-off winds are less desirable). There are many good kite schools in Cabarete along the bay and two known places to take kite lessons; Kite Beach and Cabarete Bay. Down-winders are also very popular along the North coast. How long does it take to learn to kite? 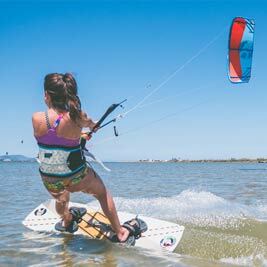 You should allow yourself around 8 hours of structured kite lessons with an IKO kiteboard instructor; use an accredited school using up-to-date, new or nearly new equipment. There are many different Yoga centres in and around Cabarete, offering different Yoga styles. Yoga at Swell surf camp is 3 times per week and Molly the Yogi there is practising Ashtanga Yoga. Yoga in the water on SUP boards, is also available on the main bay of Cabarete. 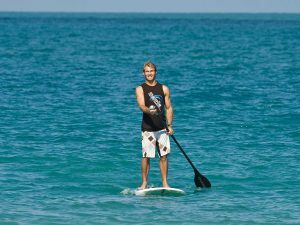 Cabarete bay provides a wonderful location for paddleboarding around a huge bay. 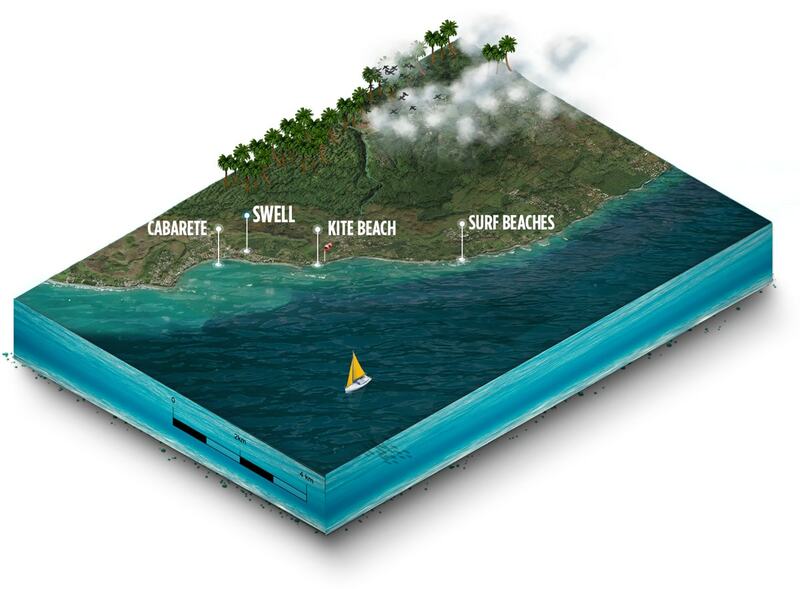 100m of paddling your SUP from the beach will have you out on the reef where you can catch ideal waves. There’s plenty of space for you to spread out and enjoy paddling in the warm water. If you don’t want to catch waves on your SUP, you can use the wide expanse of the bay to paddle and keep fit. As mentioned before, you can even enjoy a Yoga class on your SUP in the mornings. Before kiteboarding became popular in Cabarete, it was world-renowned for windsurfing. You can still take a windsurfing lesson, or rent good quality equipment from several schools situated along this wide sandy bay. Just 10 minutes from Cabarete is the pretty bay of Sosua, where you will find some really professional diving schools. Schools like TSM can get you accredited from scratch with a PADI dive course. 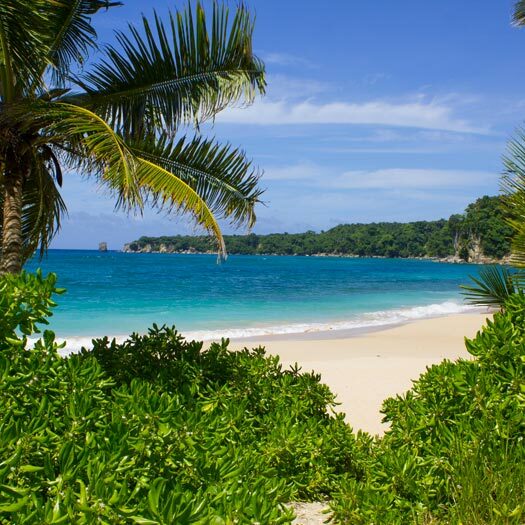 If you don’t want to dive, they will also take you out to snorkel in the bay of Sosua, which is jam-packed with pretty fish to swim with along areas of reef. Snorkelling is also possible in Cabarete, especially on kite beach in the mornings, just be careful of the low tide. 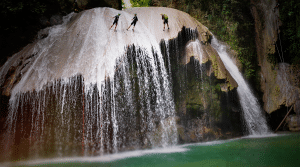 The Dominican Republic is bursting at the seams with mountains and rivers. You may not know but it is home to the highest peak in the Caribbean region, Pico Duarte, which is over 3000m high. These mountains and rivers create some amazing canyons and caves, so beautiful they will take your breath away. 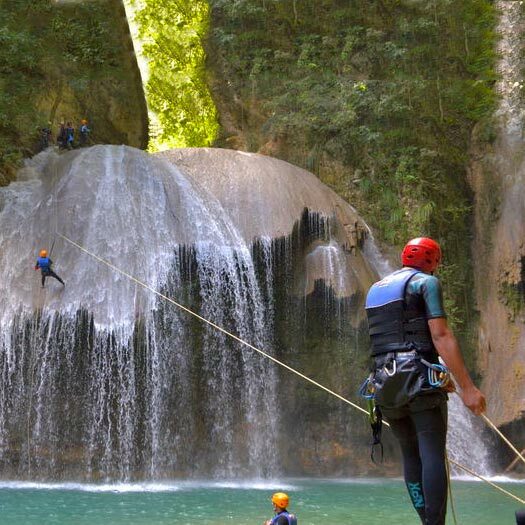 Canyoning with Kayak River Adventures is a day trip not to be missed and they have several different tours, with varying degrees of difficulty to choose from for an action-packed exhilarating adventure, exploring some real geological wonders of the world. WHAT’S ON OFFER AT SWELL SURF CAMP? 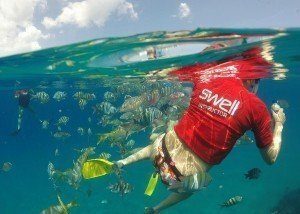 Swell has been voted Best Surf Camp in both the Dominican Republic and in the wider Caribbean region and also voted Best Surf Camp for Beginners several times over in the 9 years they have been open. Swell caters to adults who want to learn to surf in a stylish, fun place. The ‘camp’ (it’s really a stylish boutique surf retreat in Cabarete) was purpose built and the design based on the owner’s many years of surfcamp and surf travel experience. The owners knew exactly what surfers, novice or beginner surfers wanted; a social place with great accommodation and delicious food, where adult travellers could come, either solo, as a couple or friends, to experience a great surf vacation. Swell offers surf lessons for its own guests (they won’t give lessons to you if you are not staying at the camp) and has a complete concierge service to organise any or all of the other fun activities on offer in the area. You can contact us via this page. The North coast of Cabarete has waves 340-350 days of the year, ranging from chest high to overhead. Conditions for learning to surf are year round, advanced and expert surfers are best off in the winter months. 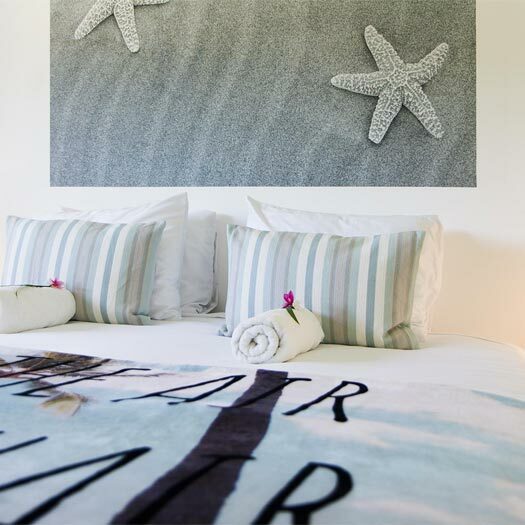 We opened in winter 2009/2010 to create a boutique luxury surf camp experience whilst having the comforts of a surf hotel. 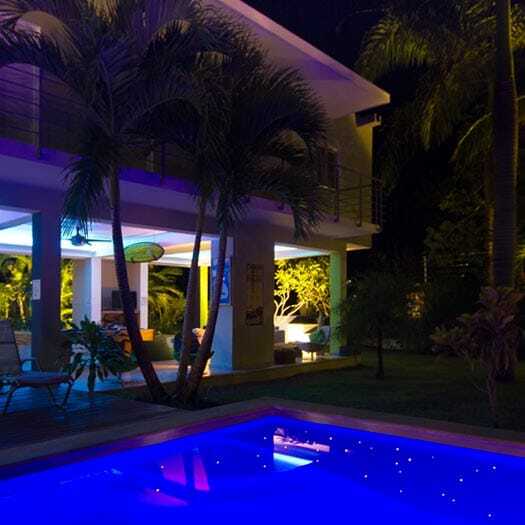 Located right in the center of Cabarete, minutes walk from cabarete main beach. Swell caters for adults who want to learn to surf or kitesurf, and want to improve their surfing & kiteboarding whilst staying at a social and comfortable place with like minded people. 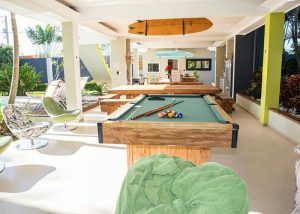 Because of the social aspect of our Cabarete surf hotel we are an ideal place to stay for solo travellers that are looking for an active holiday.